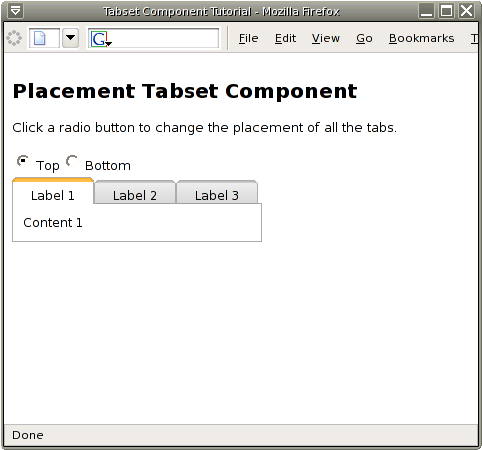 The panelTabSet component can be used to display a series of tabs, either with repeating content or unique elements inside each tab. The panelTabSet component is similar to a dataTable, except ice:panelTab is used instead of h:column. In addition to iterative components, panelTabSet supports specific elements inside each tab. The following screen shot is of the ice:panelTabSet component using the CSS XP theme in the Acronym Game login screen. The panelTabSet does not require any beans specific to the application. For example, static text can be used inside each tab using only page level tools, which removes the complexity of bean setup. In the case of each example in this tutorial, a backing bean will be used to allow greater flexibility in the content and labels of tabs. The easiest Panel Tabset setup is to use specific components and elements inside of each ice:panelTab. In this next example the page contains an ice:panelTabSet and 3 generic ice:panelTab components inside each tab. Although the text content and labels of each tab could be hardcoded on the page, we will setup 2 backing beans. The first is a basic session bean that generates the default tabs and allows for future extensibility. The second bean is Tab.java, which stores the labels and content for a single tab. The following screenshot shows what the page looks like once the beans are properly setup. To bind the beans to the page, a simple ice:panelTabSet must first be created. For now we do not specify any attributes for the Panel Tabset, and so the tag is very bare and simple. The next step is to add each tab inside of the ice:panelTabSet we just created. This will also be the first bean interaction so far. Download the tabset-basic source code here. As you may have noticed, the list based setup of TabsetBean.javalends itself to an iterator on the page. The next section will show how to use the built in iterator functionality of panelTabSet. The similarities to a dataTable are even more prevalent when the panelTabSet iterator functionality is used. As with dataTable, a value and var attribute are set for the ice:panelTabSet tag, as shown below. The iterative approach to Panel Tabset is used in the Dynamically Adding or Removing Tabs example below. The appearance of these 2 examples is rather generic and may not suit your application. 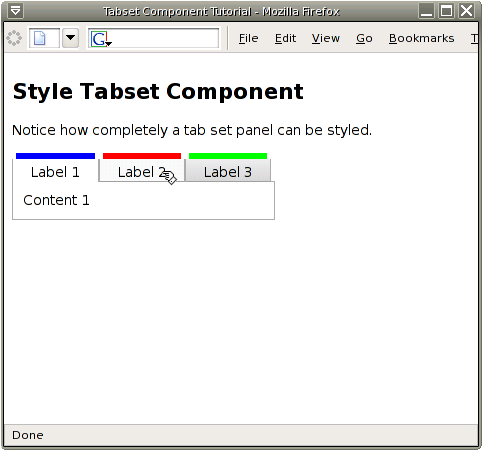 The next section will demonstrate how to customize the CSS for panelTabSet. Next the default tab styles should be copied into the override sheet. To find the default styles, look inside the CSS normally linked to, which is ./xmlhttp/css/xp/xp.css. Copy all tab related styles into a new sheet, in our case override.css. The current implementation of Panel Tabset uses a series of images to create the illusion of a tab. Because of this, the image files in the css-images folder must be copied over. Of course this could be changed to use colors, gradients, or anything the designer wants. For the above example, changing the iceTabSetTabOn class to the following resulted in a blue highlight for the selected tab. Other CSS changes were done to help display the possibilities, and since all the relevant classes are accessible the tab style can be completely changed. Download the tabset-style source code here. Interaction with the demos has so far been rather static. In the next section the dynamic addition and removal of tabs will be covered. Now we will look at how the iterative support of panelTabSet allows for dynamically adding and removing tabs. From a code point of view this functionality is merely manipulation of the backing bean list. To use the dynamic add / remove code, an iterative panelTabSet must be used, and a simple add and remove method must be added. This will create a new tab with the label and content as the next available integer based on the current number of tabs. With the automatic rendering capabilities of ICEfaces, the page would be updated to display a new tab appended to the end of the ice:panelTabSet. The method ensures that a tab remains to remove, and deletes the last tab in the list. As with addition, the page will automatically update to reflect the fewer tabs. 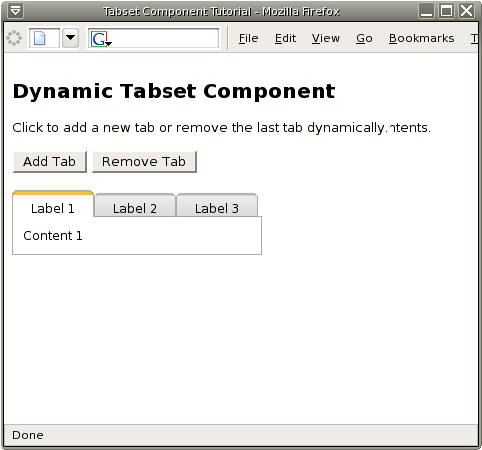 The screenshot below displays how the dynamic-tabset demo appears initially (before any tabs are added or removed). This demo uses the same backing bean setup as the basic-tabset demo above. The only difference is the add / remove methods, which can be viewed in the modified TabsetBean.java. Download the tabset-dynamic source code here. In summary, the use of a list (either ArrayList or Vector is recommended) and iterative panelTabSet allows for great control over the addition and removal of tabs. In addition to this dynamic functionality, the placement of tabs can also be seemlessly changed, as the next example will demonstrate. In this next example we are going to dynamically toggle the position of the panelTabSet between the top and bottom. This is achieved by adding a set of radio buttons to the page, which tie into a setPlacement method in the backing bean. The placement is applied as an attribute on the ice:panelTabSet tag, as shown below. The radio buttons have a top and bottom option available, the code for which follows. By using partialSubmit="true" in the selectOneRadio tag, the selected option will update the backing bean immediately. This in turn will cause the page to rerender with the tabs displaying at the correct location. The backing bean needs to be changed to have a String placement variable, as well as related getters and setters. These changes can be seen in TabsetBean.java. The following screenshot displays how the tabset-placement demo looks by default. Note that the only placement options available are top and bottom. Download the tabset-placement source code here. Component Showcase Available in release bundles Panel Tabset example which includes tab visibility, selection, adding and removing, and placement. Webmail Available in release bundles Tabs are integrated into the settings for a user, allowing form data to be categorized and streamlined. 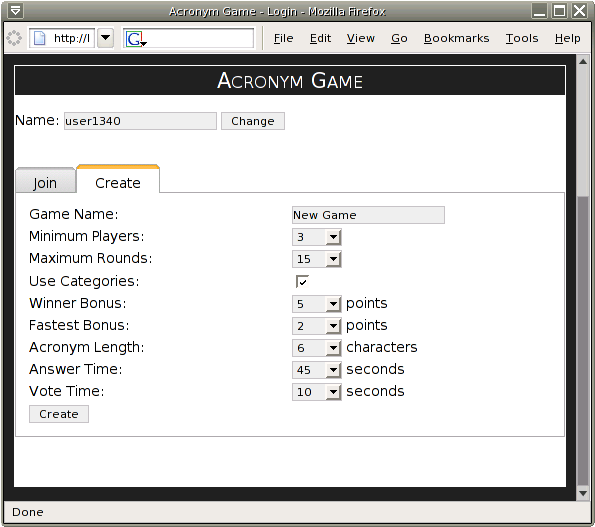 Acronym Game Available on the demo site The login page uses tabs to seperate the creation and joining of games. 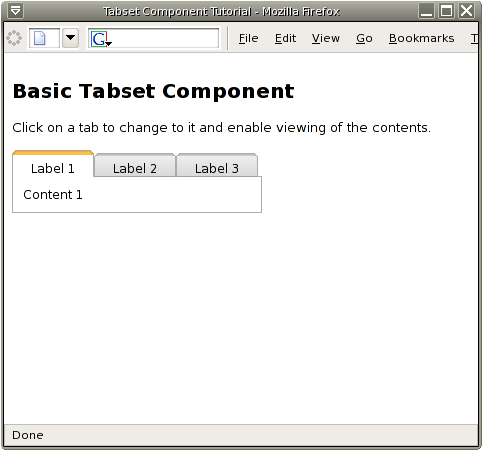 tabset-basic tabset-basic source code Simple example of how to setup a basic panelTabSet component and backing bean. tabset-style tabset-style source code Demonstration of how easily and fully a panelTabSet can be styled with custom CSS. tabset-placement tabset-placement source code Example showing the dynamic switching of tab placement. tabset-dynamic tabset-dynamic source code This example allows the dynamic addition and removal of generic tabs.